I prearranged a tour with Leanne before I arrived in NY with my two kids. As it snowed heavily throughout the night we arrived I was worried a walking tour might not be the best way to get around. We met Leanne at Columbus Circle on Central Park. It was a really sunny day and the snow was in full melt. After sharing some interesting details about the local denizens and real estate she took us for a walk down 7th Ave. past the Petrossian building and Carnegie hall. While it was interesting to see and hear about the main attractions, it was her local knowledge which was invaluable as she told us about her favorite spots such as an out of the way deli where we could sit down with locals instead of hanging around a deli full of tourist traffic. On our walk down 7th. due to the heavy snow and blazing sunshine we encountered several buildings where sparkling rain melt tumbled down in a magical display. Despite the snowfall we were able to get around easily, hopping on a bus to run down to SOHO which was one of my daughters picks for our visit. 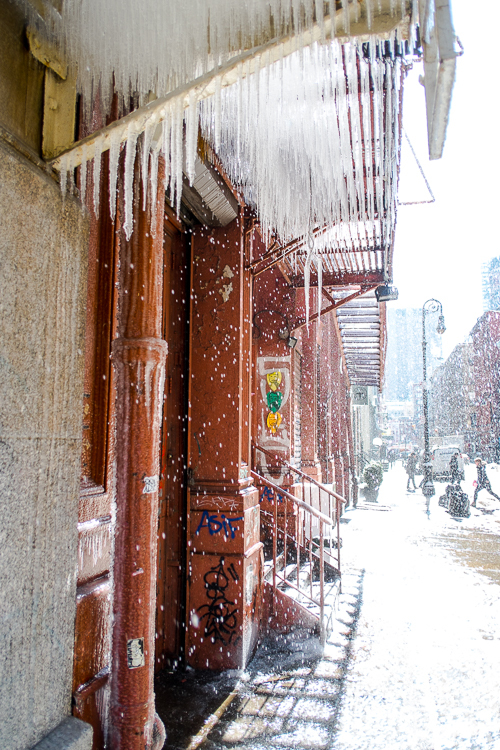 Following that, we made our way toward the East Village and once again we came across a building where the fire escape was completely covered in ice and icicles with glittering diamond rainfall sputtering down. We got some great photos with rainbow fanned sun rays. Truly spectacular. Along the way we saw some great graffiti and murals and Leanne took us to some memorable spots. We ended the trip at a dumpling restaurant where a plate of 4 was $1.25. Her advise for other stops and neighbourhoods during the rest of our trip went a long way in making our stay a memorable one.